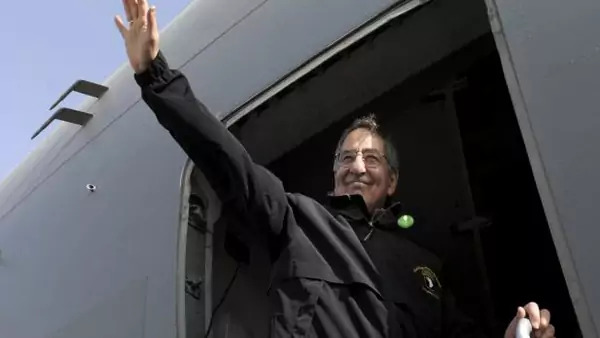 Defense Secretary Leon Panetta waves as he boards his plane on December 12, 2012 (Susan Walsh/Courtesy Reuters). In a series of farewell interviews over the past three days, Secretary of Defense Leon Panetta made some interesting observations about drone strikes. As the director of the Central Intelligence Agency (CIA) (February 2009–June 2011) and secretary of defense (June 2011–present) he has unprecedented access and insights into the U.S. targeted killings program, which both the CIA and Pentagon serve as the lead executive authority to conduct. As the director of the CIA, he personally approved roughly two hundred drone strikes in Pakistan under the rules implemented early in the Obama administration. Panetta offered several revelations, including that drones strikes were not authorized “if there were any women or children that were involved”—a view that was later corrected by a U.S. official. See below for the relevant excerpts from the interviews. Dan De Luce, “U.S. Needs to Keep up Drone War Against Qaeda: Panetta,” AFP, February 1, 2013. Asked if the CIA "targeted killings" should be curtailed in coming years, Panetta told AFP in an interview that there was still a need to continue the drone strikes more than a decade since the attacks of September 11, 2001. "I think it depends on the nature of the threat that we’re confronting. We are in a war. We’re in a war on terrorism and we’ve been in that war since 9/11. "The whole purpose of our operations were aimed at those who attacked this country and killed 3,000 innocent people in New York as well as 200 people here at the Pentagon," said Panetta, who is days away from retiring as Pentagon chief. Before taking over as defense secretary, Panetta oversaw a dramatic increase in drone raids in Pakistan as head of the CIA from 2009-2011. "I think we had a responsibility to use whatever technology we could to be able to go after those who not only conducted that attack but were planning to continue to attack this country," he said. "It’s been an important part of our operations against Al-Qaeda, not just in Pakistan, but also in Yemen, in Somalia and I think it ought to continue to be a tool we ought to use where necessary," he said. "And also where we can use it in conjunction with other countries that are pursuing the same goal," said Panetta, citing Yemen’s strong support for drone strikes. The CIA drone bombing raids, by Predator and Reaper aircraft armed with Hellfire missiles, have caused an unknown number of civilian casualties and prompted accusations that Washington is carrying out extrajudicial killings in the shadows with no genuine oversight by courts or lawmakers. Panetta, who as CIA director presided over the successful raid that killed Al-Qaeda founder Osama bin Laden, said the campaign still needed to be regularly reviewed but did not say he favored turning over the spy agency’s drone war to the military. Some critics have called for giving the US military authority over the drone air strikes, which would require openly reporting every operation. "Having said that, we always need to continue to look at it, to make sure we develop the right standards, that we’re abiding by the laws of this country, that we’re doing it in a way that hopefully can be a little more transparent with the American people." But he said "to protect this country" it was not enough to have operations carried out openly by the military. Larry Parsons, “Panetta Eager to Return to Monterey Peninsula,” Santa Cruz Sentinel, February 1, 2013. Q: How do you respond to critics who equate the Obama administration’s drone warfare to the Bush administration’s use of "enhanced interrogation techniques?" A: My view is that we are engaged in a war on terrorism that started when al-Qaida attacked this country and killed 3,000 innocent people in the Trade Towers and almost 200 people here at the Pentagon — that was an act of war. We have an obligation and responsibility to go after those who attacked our country. And that is what we have done. We have gone after the leadership of al-Qaida that was involved in that brutal attack, and we’ve done everything we can to try to make sure they would never again be able to develop the kind of plans that were involved in 9/11. We have been successful at that. We’ve used whatever technology and weapons to go after our enemy — an enemy that has total disregard for innocent people. As long as we abide by our laws, as long as we do this in a way that meets the constitutional requirements we have to follow, I believe it is a precise weapon that we have every right to use against those who attacked our country. MARTIN: As head of the CIA, Panetta oversaw the U.S. drone campaign against al-Qaida. When the intelligence identified the location of a target, Panetta often had to decide whether to fire. PANETTA: As a Catholic, suddenly realizing that I had a responsibility of saying we’re going to have to somebody was something I did not take lightly. It’s a heavy responsibility. But at the same time, there’s a flag behind the desk at the CIA, the director’s, that is a flag that was pulled out of the Twin Towers and hangs there as kind of a, something to remind everybody who sits in that chair about what the mission is. My mission, whether it’s at CIA or here, is to keep the country safe. And I thought the ability to use these kinds of tools and operations to go after those who would attack our country, I felt they were legitimate if we followed the law and did what we had to do under our law to make sure that we were being true to the American people with regards to our responsibility. MARTIN: How did the civilian deaths and the risk of civilian deaths weigh on your decision-making process? PANETTA: Frankly, we made very clear that if there were any women or children that were involved we would not take the shot. I mean, that became a rule that we abided by. MARTIN: ...a strike was called off. MARTIN: There is a lot of uncertainty about how many civilians have been killed in U.S. drone strikes. One estimate from the New America Foundation says that from 2004 to the beginning of this year, around 300 civilians have been killed in Pakistan. And there is at least one case where U.S. officials, including Panetta, knew that a woman was present at a possible strike site and the attack was ordered anyway. The U.S. official told NPR that a strike with noncombatants in the area would only happen in, quote, "exceptional circumstances against very high-level terrorists." At the CIA, Panetta saw close up how the government exercises power in the name of national security. Same thing at the Pentagon. But in this job, he got to use his own power to change the institution itself. Last month, Panetta announced an end to a 1994 policy that banned women from serving in combat. Panetta says, for him, the issue was personal. NBCNews.com. “Interview With Secretary Panetta,” February 3, 2013. TODD: You know, you’ve also been in this unique position: the drone program, the expansion of the drone program. You ran it, in some form, operational aspect of it at the CIA. Do you run actually less, are you in charge of less of the drone operation at the Defense Department than at the CIA? TODD: But who makes the calls? PANETTA: It depends on the operations. The best thing that I’ve seen happen in the four years that I’ve been back here is we really have a very good military and intelligence partnership now, with regards to going after al Qaeda. And there are operations that we’ve developed in which we develop the targets and then we make the decision who’s going to be best able to go after those targets. And, you know, it’s a very synchronized, good operation that gives us the best of both military and the intelligence. This is, have we opened a Pandora’s Box that we may regret in twenty years? PANETTA: Well, you know, as always, the United States has to always pay attention to these issues and make sure that we are applying the right standards, abiding by the laws of this country. But in the end, using what we have to use against the enemies of the United States. I mean, after all, in 9/11, al Qaeda attacked us in a brutal way that killed 3000 innocent people in our Trade Center and killed almost 200 people at the Pentagon, as well as those in Pennsylvania. It was a deliberate act of terrorism, we went to war. And when you go to war, and you’ve got an enemy out there, you’ve got to use everything you can to make sure you go after that enemy. And that’s what we did. And the fact is we had very precise, effective operations to go right at al Qaeda’s leadership. And by weakening them, and by significantly impacting them, especially with the bin Laden raid, the fact is we are safer today from a 9/11 type of attack. It’s the morality question. You know, do you sit there and say, is there a conversation that’s had when you’re making this decision, is this moral? PANETTA: You know, as a Catholic, I remember when I first became the director of the CIA and realized that I was making life or death decisions with regards to our operations. It doesn’t come lightly. You’ve got to really think about it, you’ve got to make sure that we really are focused on somebody that is a direct threat to the United States, someone who intends to attack the United States, and hurt our people. And you’ve got to be able to go through the process, and it was an intricate process, and not only of establishing the targets but going through the legal requirements to ensure that we were doing this carefully. And then also the operation side to make sure that we limited the collateral damage. TODD: But we only can take your word for it. You know, the transparency on this is very limited. TODD: Does that need to change? There needs to be more oversight? PANETTA: I think the advantage to it is that it becomes much more transparent in terms of what we’re doing.